Putin met with CEO of Sberbank German Gref. Putin.BLOG Banks Economy and Finance Putin met with CEO of Sberbank German Gref. 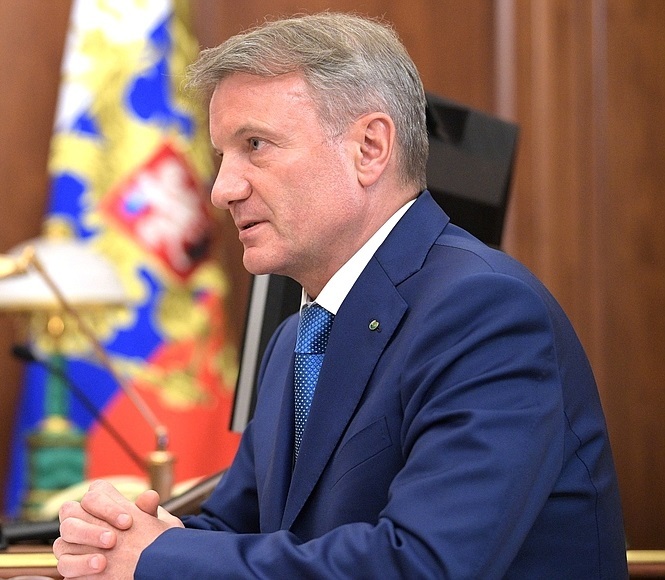 Sberbank CEO and Chairman of the Board German Gref briefed Vladimir Putin on the bank’s 2016 performance results and its current activities, including the prospects for developing mortgage lending, and new financial support mechanisms for the defense industry and agricultural sector businesses. Mr. Gref, concerning the bank’s performance, we know the portfolio, its structure, revenue growth and profit – we know all of these figures, but I would like to hear your view on some matters. Mr. President, last year was quite a good one for the bank. As far as our financial results go, it was the bank’s most successful year ever. We earned a net profit of 517 billion rubles, according to Russian accounting standards. Previously, 2013 was our best year, before the crisis, when we had a net profit of 360 billion. Overall, 2016 was not an easy year, and so we think this result was very good. We had good results in general last year for all the main indicators. Last year, we lent more than 9 trillion rubles to our corporate clients. Corporate lending growth was minimal. Unfortunately, demand is still low, and then the revaluation of the loan portfolio to take into account the stronger ruble meant that the portfolio hardly grew at all last year. But if we look at the absolute lending figures, corporate lending was up 35 percent last year, compared to 2015. 2015 was a crisis year, of course, and perhaps is not the best comparison in this sense, but nonetheless, we see relatively positive development. Lending to retail clients reached 1.6 trillion rubles last year. Our retail lending portfolio growth was not high – around 8–9 percent, but if we take into account the factors I mentioned, such as the stronger ruble and so on, this represents growth of 28 percent compared to 2015. Yes. We see that things are really picking up, even if the situation is not yet back at pre-crisis levels. We haven’t yet returned to the 2014 level. Our loan portfolio’s quality is very important for the bank, of course, and it showed serious improvement last year. We have reduced the share of overdue debts by more than a percentage point – from 3.1 percent to 2 percent of the portfolio. This had a significant impact on our profit figures, of course. If we compare our portfolio’s quality and the risks we manage, we are performing 2–3 times better on average than the market. This, of course, is the result of our use of a large number of risk management systems, including automated risk management systems, of course. This has given a big boost to our net profits. As far as lending interest rates go, Mr. President, at the end of last year, they were back to the pre-crisis level for nearly all products we offer. One of our indicators is the capital adequacy ratio, because banks are the only type of business that must maintain a certain capital level at all times. As we did not receive money from the state, we ensure our capitalization completely from our net profits. All the money we earned last year was put into our capital, except for the 20 percent in dividends that we paid to our shareholders – more than 100 billion rubles, of which more than 50 billion rubles will go into the national budget via the Central Bank. Mr. President, there are two traditional questions you usually ask me. The first one is mortgage lending. And also agriculture and the defense industry. Let me start with mortgage lending. Our mortgage loan portfolio posted good growth last year. Sberbank today has 55 percent of the mortgage loan market. We have grown during the crisis period and we maintain our share now, primarily through the launch of a number of interesting products. I want to tell you about a very interesting program we will develop this year. We are implementing it together with the Government. We launched a new product, offered by our subsidiary company – the Mortgage Online service, available via the site DomKlik, where clients can make their applications and sort out all documents needed for getting a loan and choosing an apartment, without having to come to the bank. They only have to physically come to the bank once, because, unfortunately, the regulations do not yet allow documents to be signed online. So, they have to come once to actually sign the documents. But the first stage, everything related to the commercial sector, selecting an apartment and obtaining a loan, can be done online, using the one-stop service. Last year, we started an experiment, together with the Government. We thank Mr. Igor Shuvalov for supporting this initiative. In general, we did not even imagine it would have such good results last year. We started a joint project with Rosreestr [the Federal Service for State Registration, Cadaster and Cartography,], and it is now possible to register property rights via Sberbank in just four days, without having to go to Rosreestr. In other words, you get a mortgage loan, choose an apartment, draw up the purchase and sale agreement, and four days later, you receive electronic confirmation of your registration and can then take possession of your new apartment without having to take any further steps. Seventeen percent of our clients already use this service. This is a big advance, of course, and tens of thousands of apartments have already been registered this way. We are now working with Rosreestr to completely automatize this process and make it completely online. If people go through real estate agents, this whole process, from beginning to end, usually costs them 150,000 rubles, but today, this process costs around 10,000 rubles. This is the first project of this kind, and we want to continue it with other state agencies, so that people will not have to run around the banks and state offices. This is a good project. And it is bringing down costs. What is your mortgage lending interest rate today? Mortgage loan interests are at a historic low right now. Interest rates will come down further this year, given the ambitious plans to reduce inflation. I therefore think that we will be able to offer record low interest rates for mortgage loans. Small business is another important segment. Last time I briefed you on our work, I said we had a problem in that we had not yet learned to lend to small business, and had seen a big drop in our lending in this sector. We launched a new project at the end of last year – Smart Credit, based on an analysis of the transactional data of clients we have had for more than 18 months. We do not require clients to provide us with information, but analyze their entire activity using big data technology, and we send them a proposal to take out a loan. Last year, 63,000 clients received such a proposal, and we extended loans worth more than 11 billion rubles using this new technology. It is too early for boasting, but we see that for the first three months the project has been running, overdue loans (which, unfortunately, are a problem in small business) came to only 11 million rubles. This is a record low. We are now improving this product and trying to expand it to new groups of clients. This is a completely new approach. Using this technology made it possible to reduce risks and reduce bad loans at the end of last year, and this made it possible to reduce interest rates on loans for small business by 1.5–5 percent. Today, the maximum interest rate for loans for small businesses is 15–16 percent, and the minimum 11.5. Previously, the minimum rate was 15 percent. This is a big step forward, of course, and I hope that we will make great progress this year in lending to small business, all the more so as we, together with the tax service, carried out an original new project last year to provide ‘smart tablets’. These ‘smart tablets’ offer a full range of possibilities for registering a legal entity online, opening an account online, and carrying out accounting, tax reporting and financial reporting – all online. They automatically connect with the tax service’s ‘cloud’, and in general, they represent a big step forward. What’s the situation with the agricultural sector and the defense industry? Do you lend a lot to these sectors? Last year was not such a good year as far as lending to the defense industry went, because defense industry companies reimbursed a large number of loans, and this meant that our loan portfolio in this sector fell. They paid back earlier loans? Yes. As far as the figures go, the results were not so good because we were the biggest lender to the sector and had a huge amount of returned loans at the end of the year. But this is good for the defense industry. For the defense industry it’s good, but for the bank, it’s not so good. Most important though, as I briefed you in Izhevsk, are the completely new approaches to restoring enterprises to health. This year, we are starting a comprehensive program with a number of companies we started working with earlier. This involves not just the provision of loans, but also drawing up a joint program for business recovery, financing, and monitoring the implementation of new corporate management technology. Our loan portfolio to the agricultural sector is growing very fast. This sector in general has withstood the crisis and is our only loan portfolio that practically did not suffer at all. We are the biggest lender in this sector. We worked hard last year with the Agriculture Ministry, and this year began working on a new mechanism for subsidies to the sector. The first quarter will not be easy, when we are putting the new system through its first tests. Unfortunately, various glitches usually come up in this process. By March, we will have an idea of how it is all working, but I think that the mechanism that the Agriculture Ministry proposed will ultimately produce good results. What’s new about the system? Yes. If companies have projects that fit with the areas the state authorities have decided to subsidized, and if the bank agrees to finance these projects, seeing their risk level as acceptable, the interest rate is automatically subsidized by the state. This is a new system that was partially used earlier, but the Agriculture Ministry has decided to expand it substantially now. So, the bank is acting here as an agent for the Government? Essentially, yes. We are acting as a commercial agent. 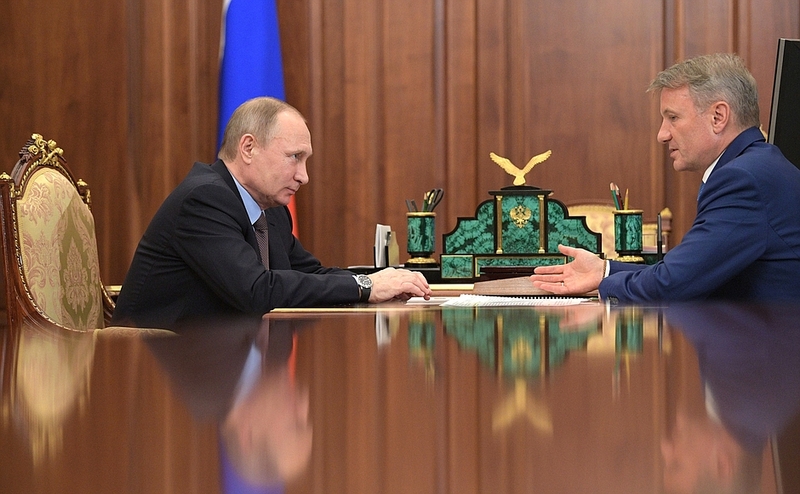 President Putin meeting with Sberbank CEO in Kremlin. 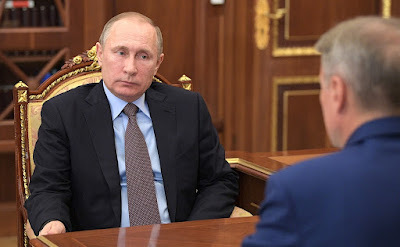 Vladimir Putin and German Gref in Kremlin. 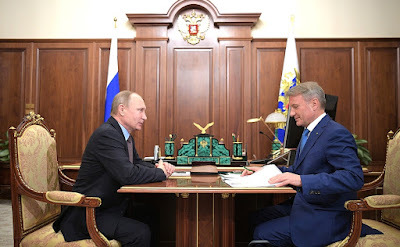 Sberbank CEO and Chairman of the Board German Gref with Russian President Vladimir Putin. 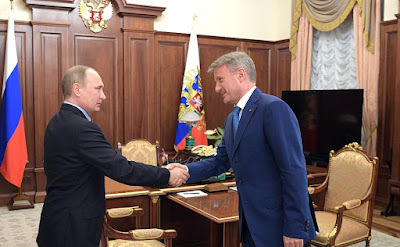 0 Comment to "Putin met with CEO of Sberbank German Gref."